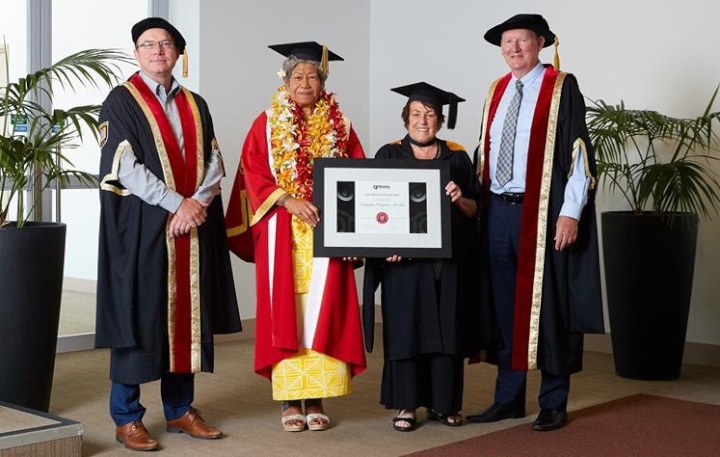 A driver of change in support of better health and welfare for Pasifika people has been awarded an honorary fellowship from Wintec. Leaupepe Elizapeta (Peta) Karalus was awarded a prestigious Honorary Fellowship at Wintec’s Health and Social Practice Graduation ceremony this week. On receiving the award, Karalus shared some insights with the 180 health and social practice graduates at the event. Wintec council Chair Barry Harris said that Karalus’ conferment at Wintec’s Health and Social Practice Graduation event was fitting, considering her considerable passion for nursing. “Peta, as she is known to many, is a health professional with many years’ experience who has a relentless passion for helping the Pasifika community. On top of this, she led the establishment of the Pasifika Power UP Plus programme in 2016, to support Pasifika parents, families and communities to champion their children’s learning. Developed and funded by the Ministry of Education, PowerUP is a success and the collaboration between Wintec and K’aute Pasifika made this a reality.